This time of year we celebrate a very significant birthday. The birth of one who so dramatically affected history, that it provided the line of demarcation in reference to the human timeline. Anno Domini, Latin for “the year of our Lord,” contracted to AD, is affixed to all legal documentation signifying years since that important birth, and BC, or “Before Christ,” represents the human timeline before that historically documented advent. Birthdays are significant for they acknowledge the arrival of someone who has touched and influenced the lives others. They’re much more than just acknowledgement of a single day representing their arrival on the scene, but rather celebrate the contributions and influence of one’s life on others. Based solely on the universally accepted Gregorian calendar, there is no more significant birthday than Jesus Christ’s. Academics seeking to secularize the de facto Gregorian calendar dating system used globally, have attempted to replace the AD and BC designations with the more nonsectarian references of CE and BCE, or Common Era and Before Common Era. But try as they might, they just can’t seem to get away from the dating system centered on the birth of one Jesus of Nazareth. However they choose to reference it, it’s still based on the birth and life of Jesus. Even though December 25th is not the day Christ was born, it has become the worldwide custom for acknowledging and celebrating it. The actual date of His birth is unknown, although Biblical scholars are in unanimity that it was not the 25th day of the twelfth month. Recognizing it at that time was very convenient early on since pagan festivities were in full swing at that time of year and it allowed early Christians to celebrate Christ’s birth unnoticed since they wouldn’t appear conspicuously celebrating at a time the pagans weren’t. The tables have turned over the centuries. Here in American apparently 92% of us celebrate Christmas, while only 6% claim they do not. 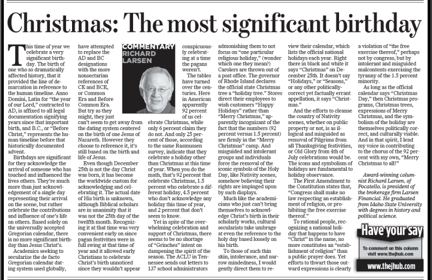 And only 25% of those, according to the same Rasmussen survey, indicate that they celebrate a holiday other than Christmas at this time of year. When you do the math, that’s 92% that celebrate Christmas, 1.5% who celebrate a different holiday, 4.5% who don’t acknowledge any holiday this time of year, and 2% that don’t seem to know. Yet in spite of the overwhelming celebration and support of Christmas, there seems to be no shortage of “Grinches” intent on dampening the spirit of the season. The ACLU in Tennessee sends out letters to 137 school administrators admonishing them to not focus on “one particular religious holiday,” (wonder which one they mean?) Carolers are thrown out of a post office. The governor of Rhode Island declares the official state Christmas tree a “holiday tree.” Stores direct their employees to wish customers “Happy Holidays” rather than “Merry Christmas,” apparently incognizant of the fact that the numbers (92% versus 1.5%) are firmly in the “Merry Christmas” camp. And misguided and intolerant groups and individuals force the removal of the iconic symbols of the Holy Day, like Nativity scenes, somehow believing their rights are impinged upon by such displays. Much like the academicians who just can’t bring themselves to acknowledge Christ’s birth in their scholarly works, cultural secularists take umbrage at even the reference to the holy day based loosely on his birth. And the efforts to cleanse the country of Nativity scenes, whether on public property or not, is as illogical and misguided as removal of Pilgrims from all Thanksgiving festivities, or Old Glory from 4th of July celebrations would be. The icons and symbolism of holidays are fundamental to holiday observance. The First Amendment to the Constitution states that, “Congress shall make no law respecting an establishment of religion, or prohibiting the free exercise thereof.” To rational people, recognizing a national holiday that happens to have “Christ” in the name, no more constitutes an “establishment of religion” than a public prayer does. Yet efforts to thwart those outward expressions is clearly a violation of “the free exercise thereof,” perhaps not by congress, but by intolerant and misguided malcontents exercising the tyranny of the 1.5% minority.